Midi not passed to gpscipt? I have set song list/ setlist option to move up and down with cc67 and 68 respectively. I “learned” those in the gigperformer preferences. I have a script that among other things, resets a song part “alternate” button when cc67 or 68 is received. But it seems that GP captures it , moves up the songfest but doesn’t send the signal to gpscript - is that true? If true, is there a way to pickup the signal from the midi in block or elsewhere so that my gpscript can respond to those codes. Other solution is to hard code the up and down codes in the script. 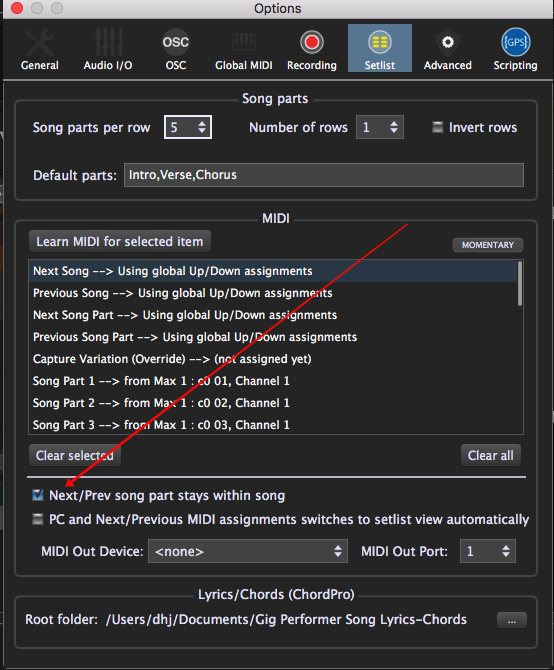 All Midi Events you map to global control or widget control are not be seen in gp script. Is there a way to emulate the global midi behavior where scrolling through song parts also scrolls to the next song when scrolling past the last song part (on previous song when scrolling above first song part)?